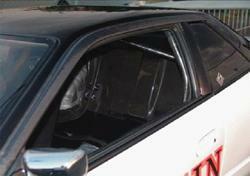 Origin USA Window Visor NISSAN - Dezod Motorsports Inc - Home of the automotive performance enthusiast since 2002. The Origin Window Visor adds a unique look to your doors. Aside from looking great, the visor also allows you to have your windows slightly open in the rain. No more embarrassing fogging while getting it on! Available in both FRP and Carbon.